Cozumel Palace, a premiere choice of Cozumel resorts offers an unforgettable beachside vacation, surrounded by sparkling clear blue waters and friendly and courteous service from the staff. The all-inclusive Cozumel Palace is the ultimate destination for scuba diving through the island’s magnificent coral reef, the second largest reef in the world. Snorkel right in front of the resort and then take advantage of the Kids Club, pools, excursions, entertainment and spa services. Ideally located near many popular attractions, including beaches and swimming with dolphins, Cozumel Palace is only a 15-minute walk to downtown San Miguel. Guests may choose from a wide variety of activities during the day and different entertaining shows each night. The all-inclusive package includes Wi-Fi, fine dining, snacks and beverages, 24-hour room service, non-motorized water sports and top shelf drinks in the bars and restaurants. COZUMEL PALACE… YOUR PERSONAL ISLAND GETAWAY. Dive into the underwater beauty that Cozumel holds by taking part in a scuba diving adventure through the island’s magnificent coral reef, the second largest reef in the world. You can also snorkel in Cozumel’s clear waters right in front of the resort, and then take advantage of the Playroom, pools, excursions, entertainment and spa services. This elegant and intimate resort is a water lover’s paradise—all 169 luxurious suites look out into the pristine waters of the Caribbean Ocean. Guestroom options include Junior Suite, Concierge Level and Loft Suites. Each suite boasts a spacious seating area and a double whirlpool ideal for relaxing after a day of exploring. You can also savor the crisp ocean breezes of the Caribbean waters from your own balcony. Embrace The Luxury Of Global Dining: Welcome to a world of yum—savor Italian, Pan-Asian, and Mexican entrees at four different restaurants at Cozumel Palace. Dine on your schedule, according to your mood. There is a variety of options always available to satisfy your cravings, including balmy outdoor dining areas, elegantly laid back indoor restaurants, and more formal options for romance and magic. Accent your meals with a bevy of top shelf wines and beverages including unlimited wine by the bottle from wineries in Spain, Argentina, California, France, Italy, Chile, and Mexico. Turquesa Restaurant: Embrace the morning with a continental breakfast with a prime poolside view. Or slip in during the day for a hearty lunch. By evening, Turquesa offers masterfully prepared authentic Italian dishes a la carte and a delightful international buffet. There is a breakfast buffet from 7:00 a.m. to 11 a.m., a lunch buffet from 12:30 p.m. to 4:00 p.m., and a la carte dinner from 6:00 p.m. to 11:00 p.m.
Bugambilias Restaurant: Welcome to an authentic Mexican dining experience. The cuisine here is prepared with the freshest ingredients, artful flair, and time-honored traditions, and the restaurant’s laidback Mexican country atmosphere lends it festive laidback elegance. Enjoy a la carte dinners from 5:30 p.m. to 11 p.m.
Momonohana Restaurant: Savor the pageantry of teppanyaki cooking, the fine art of sushi, and the variety of exotic options in a Pan-Asian fusion dining experience. The refined simplicity of this option makes it perfect for intimate dinners and family outings. Adjacent to pool area. Flamingos Snack Bar: Flamingos Snack Bar: Enjoy daytime snacks at this poolside swim-up bar & grill. Come back for dinner and enjoy a delicious BBQ buffet. Gourmet pizzas: from 3:00 pm-9:00 pm. Room Service: As part of the all-inclusive offerings, you can indulge in a full menu of in-room food and beverage selections at any time. The dedicated staff is ready to serve you in the privacy of your own room, ensuring that all meals, no matter what time of day it may be, are delivered quickly and beautifully presented too. Lobby Bar: Take a break from the outdoor excitement in the lobby bar. Recharge indoors with your favorite cocktail prepared to your liking, or grab a beer or a delightful glass of wine. Bar with Top-Shelf brands. Hours: 10:00 am – 12:00 pm. Oceanfront opulence… This elegant and intimate resort is a water lover’s paradise—all 169 luxurious suites look out into the pristine waters of the Caribbean Ocean. Guestroom options include Junior Suite, Concierge Level and Loft Suites. Each suite boasts a spacious seating area and a double whirlpool ideal for relaxing after a day of exploring. You can also savor the crisp ocean breezes of the Caribbean waters from your own balcony. Ocean View Suite: The Ocean View Suite is located on the 1st & 2nd Floor, with an amazing ocean view. Choose from 1 King or 2 double beds. Enjoy the seating area, double whirlpool tub, in room wine, private bath with shower only, Most with balcony and hammock to relax in there. Max Occupancy: 4 guests including children & infants. Ocean Front Suite: The Ocean Front Suite is located on the 3rd & 4th Floor. Choose from 1 King or 2 double beds. Enjoy the seating area, double whirlpool tub, in room wine, private bath with shower only, and a balcony with a hammock to relax in front of the ocean. Max Occupancy: 4 guests including children & infants. Concierge Level: Welcoming Mexican Caribbean ocean views greet you as you step out onto your own Concierge Level balcony. Equipped with all luxurious amenities as the Junior Suites offer, the Concierge Level also boasts an upgraded liquor brand of rum, tequila, whiskey, and vodka. It is the perfect way to celebrate in private with friends or your loved one. Sleep soundly on a comfortable king sized bed, enjoy L’Occitane bath products, a double whirlpool with a separate glass enclosed shower and an aromatherapy menu. The Concierge Level also offers two 25 minute back massages at the beach/spa treatment rooms for you to enjoy by yourself. Concierge rooms accommodate two adults and are non-smoking. Loft Suite: Lower level with 1 Bedroom w/king size bed, double whirlpool tub & private bath w/ shower. Upper level with 1 Bedroom w/double beds, private bath w/ shower only. Balcony w/hammock. Max Occupancy: 4 adults and 2 children (6 guests). 827.3 Sq. Ft. Kids Club: The Kids Club, open to children ages 4 to 12, is based in a room off the lobby with a loft, toys and games, and a TV. It’s open from 9:30 a.m. to 4 p.m. daily, and again in the evening from 7 to 9:30 p.m. Activities include treasure hunts, cookie-decorating, face painting, games in the kiddie pool, arts and crafts, movie nights and masquerade nights. In the evening, the kids are provided with dinner from a menu featuring items like burgers and fries, pizza, grilled cheese sandwiches, chicken fingers, quesadillas, spaghetti and ice cream. Close your eyes, take a deep breath, and picture your dream destination wedding. Imagine each detail that makes it personal and reflective of your sentiments and your sensibilities. That’s what a dream destination wedding should feel like, and that’s what Cozumel Palace will give you. Celebrate your love at Cozumel Palace and find out what it means to have a perfect wedding. Begin your life together with the best team of wedding coordinators behind you taking care of every detail. Complimentary Wedding Package: Whoever said “the best things in life are free” must have attended one of our Palace Resorts’ complimentary weddings. Simple, yet elegant, the complimentary wedding collection is an understated exploration of beachy neutrals, juxtaposing brown and white against the beach sand for a beautifully refined presentation. Exotic Peacock Wedding Package: Turquoise combines the light blue of the sky with the invigorating green of the sea, a key theme in this exotic wedding inspiration. Chiavari chairs are adorned with brilliant turquoise and crisp white fabrics; green bamboo vases filled with peacock feathers, silver curly willows, and two kinds of flowers, Hydrangeas and Cymbidium Orchids, sit at the top and end of the aisle. Vow Renewal: Say “I do” once again, in paradise. Renew and reinvigorate your love. 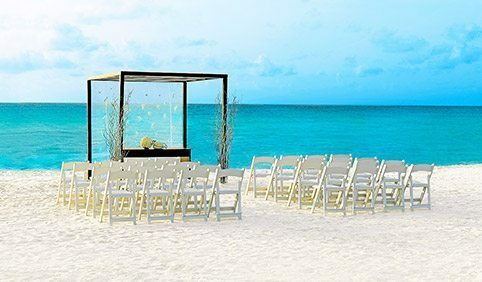 Choose from any of their stylish collections for your vow renewal ceremony.